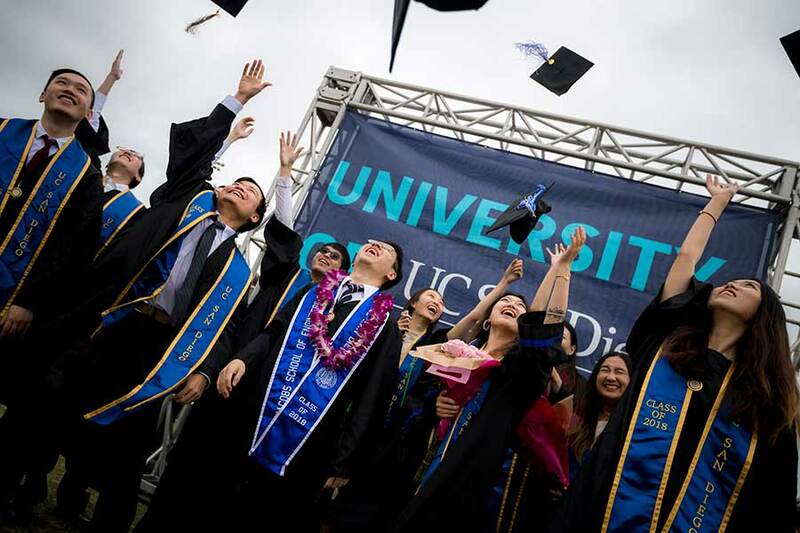 Messages of hope, perseverance and giving back were delivered to thousands of members of UC San Diego’s graduating class of 2018 who gathered Saturday morning for All Campus Commencement. 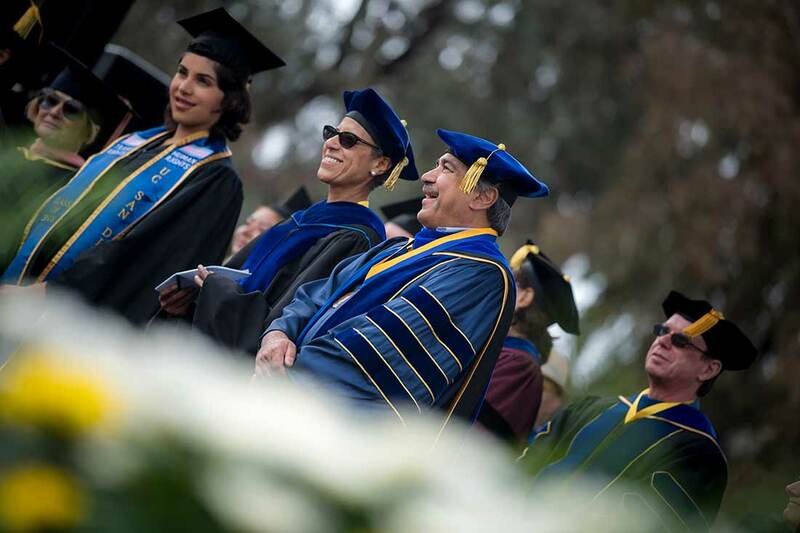 The campus’ next generation of groundbreakers heard from Chancellor Pradeep K. Khosla, graduating student Lucero Camarena and alumna Kimberley Phillips Boehm, ’82. Speaking to a crowd of nearly 5,000 graduating students and thousands of their guests, Khosla started off by congratulating the class of 2018 and empowering the students to use their education to make the world a better place. In a complex, global society with ever-escalating challenges, he implored students to follow the example of faculty and researchers on campus: collaborate and work in diverse environments, as it is the key to innovation. He spoke about how UC San Diego is doing its part to change this statistic with its ongoing outreach efforts to underserved high schools and the establishment of the Chancellor’s Associates Scholarship program. 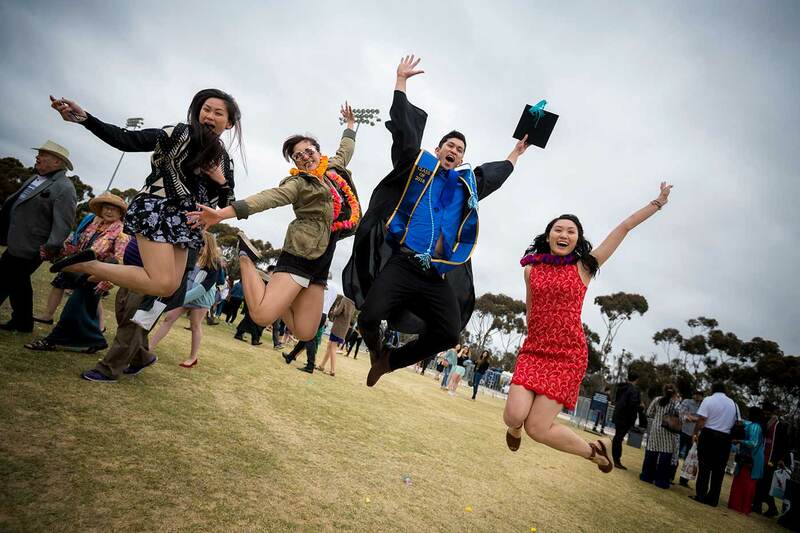 Through its generous financial aid offerings and services to students, the program continues to boost the number of first-generation and low-income students who graduate from UC San Diego. Kholsa spoke in place of Rep. John Lewis, due to UC-wide speaker boycott called by AFSCME Local 3299. However, throughout the talk, Khosla encouraged the crowd to emulate the civil rights icon, urging them to act out of compassion, stand by their principles and listen to their conscience. Each student in the audience also received a copy of Lewis’ book, “Building Bridges,” as a graduation gift. Khosla concluded his speech with an excerpt from the book. 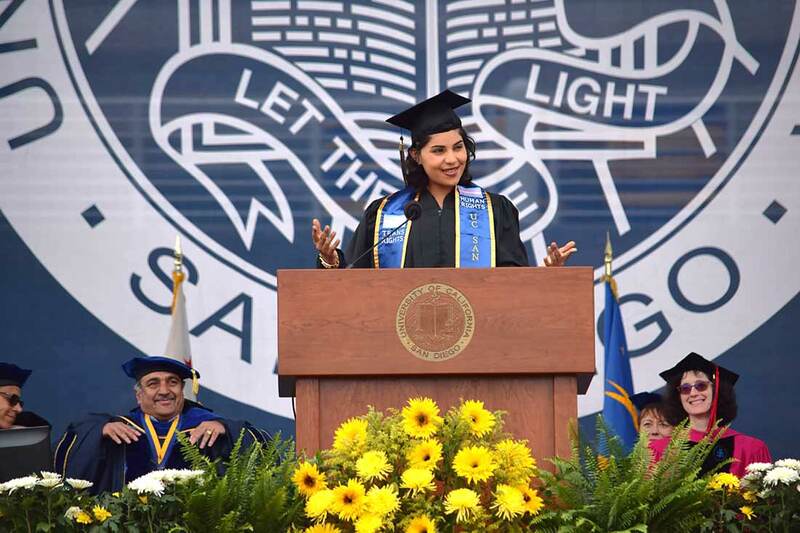 Lucero Felicita Camarena served as the student speaker and shared her personal story of struggle and success. Out of shame and fear of sharing her truth, Camarena did not speak again until age six. With her speech and literacy delayed, Camarena quickly fell behind in school. Camarena said a school counselor intervened, insisting that she was valued, smart and deserving of an education and the successes it ensues. This one mentor changed everything for Camarena. “I soon became the first of my family to graduate high school, transfer to UC San Diego and now earn a college degree,” she said to a roaring applause. Camarena’s talk was infused with compassion, as she instilled a sense of responsibility and compassion among the graduates. She echoed the importance of helping underserved communities in our region. “There are current and future legacies of resilience, and leadership that we are denying when we fail to advocate along with and uplift those oppressed by our borders,” she said. With the goal of attending medical school with an undergraduate major in global health, Camarena plans to continue to push boundaries and make positive change as a physician-scientist. She concluded her talk by giving thanks to the communities on campus that helped her and fellow students. Alumni speaker Kimberley Phillips Boehm also uplifted the crowd with words of strength and encouragement. An award-winning author whose research and scholarship focuses on the history and culture of African Americans and U.S. workers, Boehm received a Bachelor’s degree in history from UC San Diego in 1982. She earned a Master’s degree and Ph.D. from Yale University before leading a long career as a university academic and administrator. She served as a faculty member at the College of William and Mary. Boehm later became founding dean of the School of Humanities and Social Sciences at Brooklyn College-CUNY, then served as provost and dean of the faculty at Mills College. 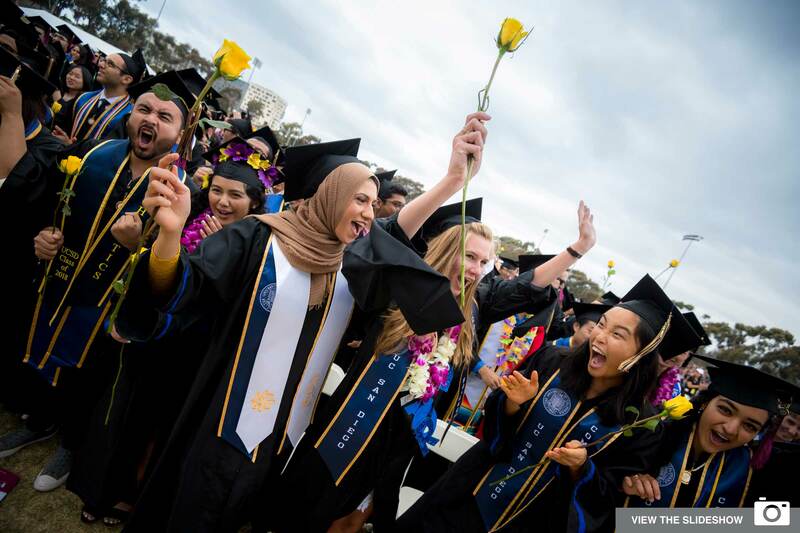 Boehm began by acknowledging the diverse backgrounds the class of 2018 brought to the UC San Diego campus. She also spoke of the challenges this generation continues to face. However, Boehm said these challenges are also opportunities, and she spoke of how she is inspired by the ideals of this generation, which continue to right the wrongs of the 21st century. 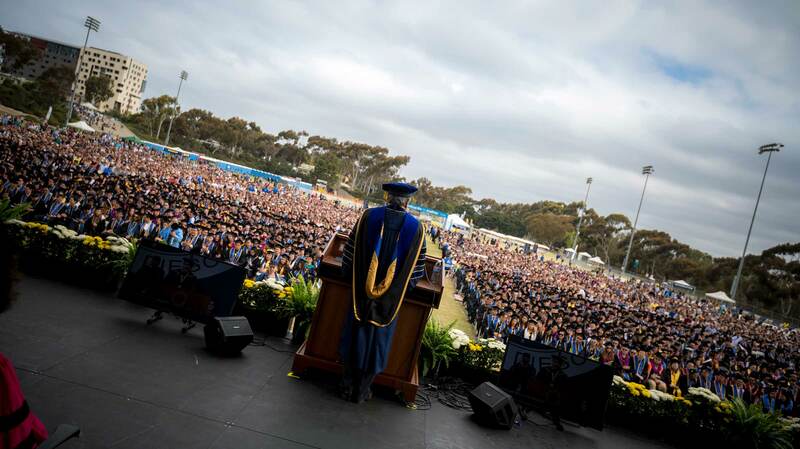 For more information on UC San Diego’s All Campus Commencement and to view a recording of the event, click here.